Jersey Girl. Gemini. Wellness Enthusiast. You’re probably curious how I wound up here doing this work, right? Well, grab some tea and get cozy, because it’s a story with twists and turns. What you should first know is that I’m a multi-passionate entrepreneur and a Gemini. So, as you can probably imagine, it never gets boring over here. Living a healthy, conscious lifestyle. That means loving up and taking care of my body, my mind, and my heart so that I can show up as the best version of myself every day. It means practicing kindness and compassion. It means surrounding myself with people that believe in me and inspire me to be better. And it means being mindful of my impact on people’s lives and the planet. While I’m certainly nowhere near perfect at any of the above, I’m committed to it with my whole soul. Since age 9, I’ve been typing stories and writing in journals; since 23, crafting well-worded emails and landing page copy; and since forever, finding new ways to describe the ordinary. Words are art to me and it’s a gift I’ve been lucky enough to use in service of a community I adore: the wellness wonderland of coaches and teachers. I love playing a part in bringing their brands to life online, so they can bring their innate gifts to the world through a personalized online presence. One of the biggest discoveries I’ve made is this: the only way for any of us to stand out and make an impact in any industry is to BE ourselves. We must own our truth, express it, and stand confidently in it. So, my mission is to inspire as many entrepreneurs as possible to dig into the beauty of who they are, bring it to life in their branding, and become natural magnets for the people they’re meant to serve. The first 30 years of my life were spent finding my voice and learning to trust my intuition. Because I was in many cases trying to fit into the perfect box: be the nice girl, the popular girl, the cool girl, the pretty girl, etc. Yet, the more I tried to be well-liked, the less I felt like I fit in. And this impacted how much truth I shared with the world for a really long time. I was afraid to raise my hand in class for fear of getting the answer wrong. I was uptight about being late and was made fun of when people saw me racing down the hall to homeroom. And in my adult life, I hid behind the scenes at my first few jobs to keep the peace and stayed in the wrong romantic relationships for too long. If I could distill how I felt back then, it would be not enough. Not good enough, smart enough, cool enough, likable enough. Those feelings led me to question and doubt all of my choices, almost all of the time. After I graduated from college, I set off to find a job in the magazine industry in New York City. Despite my underlying insecurities, I did know that I wanted to find work I loved and to write. Because writing has always been my thing (see above!). My first job was at a super small magazine as an editorial assistant. And while the magazine itself isn’t with us anymore, what does still exist is the online magazine spin-off I started: collegecandy.com. That was my brainchild at 23 years old, which is a whole other story. Around 2007, I got hired as a sales assistant at Harper’s Bazaar. And this was when life got interesting. While at first, it felt glamorous to work in the Hearst Tower, eat lunch in the same cafeteria as Oprah, and attend the same events as Ashley Olsen and George Clooney, the reality of my work environment set in pretty quickly. There were many days where I had to walk on eggshells for fear of getting yelled at or worse brought to tears for a mistake I’d made. I even remember my boss being furious that I was out of the office for a week with the flu (true story!). All the stress and pressure led to a moment where I was sitting at my desk and experienced what felt like a panic attack. Healthy? Far from it. To make myself feel like less of a failure, I would grab a sugary latte from Starbucks or dip into the head designer’s well-known candy drawer for a pick-me-up. I felt sad, overweight, exhausted, and so unclear about what I was doing with my career and my life. I even seriously considered moving to San Francisco. Something was missing in my life and I needed to figure what that was. Being the introspective, curious lady I am, I found my way to the self-help aisle of Barnes & Noble and devoured every book I could get my hands on. It was in those moments that I learned what “being present” really meant, how to meditate, and what I really needed to feel happy. After breaking free of the fashion world and finding a job at a non-profit, I felt like I was moving in the right direction. This job felt more meaningful because it truly was making a positive impact in other people’s lives. However, I still had this strong feeling that this wasn’t “it” yet. And one day, everything changed. While in a Google rabbit hole, I discovered a brand new career option: Health Coaching! Thanks to a wellness center’s website, I found my way to integrativenutrition.com and was in such disbelief that a school like this one actually existed. Suddenly, I was filled with that excitement, that knowingness, that “YES, THIS IS WHAT I’VE BEEN SEARCHING FOR” feeling. Within a few months I signed up, and it was one of the BEST decisions I ever made. Not only did I go on to get my health coaching certification, but I was also hired to work in the marketing department at IIN. And it was at this job that I found my voice and my confidence. I was so happy and excited to be working for a company that I believed in, that I was slowly but surely able show up without fear and shine my light. This led to 2 promotions, emceeing conferences, speaking on stages in front of thousands of people, and wearing a million marketing hats. I also reconnected with my writing talent and learned a ton about online marketing, sales pages, funnels, and branding–you name it. 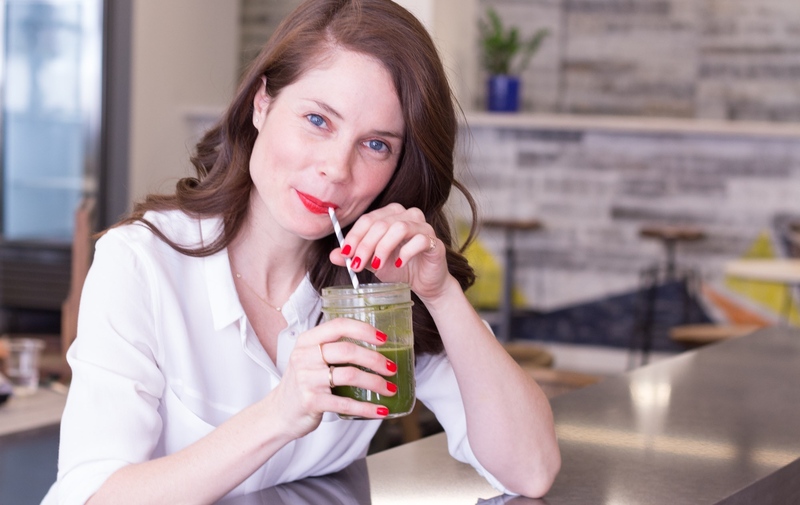 After IIN, I went on to pursue the world of entrepreneurship and I worked as a part-time health coach at Parsley Health while building a marketing consulting business, which eventually evolved into branding and copywriting business. And when my client load got too full to balance out both gigs, I left Parsley and the rest is history. Today, I have a beautiful brand that is 100% me. What you see on my website is who I am in real life. While my hair isn’t always perfected coiffed, I wear that red lipstick and those exact jeans, blouses, and chambray shirts all the time–ask my husband! Since 2014, I’ve worked with over 200 wellness entrepreneurs, including health coaches, best-selling authors, and thought leaders in the industry. And have built a 6-figure business. Never did I imagine any of this was possible. Yet, what made it so was my willingness to trust the unfolding of my life, to use my voice, and to honor my intuition.